VENENOR: It’s great that fans of the Weaponeers are taking to the evolution of the Crystal Gohlem. At the end of the Prologue we saw that the revived Crystal Gohlem accompanied the Stranger back to his world. I’m looking forward for that tale and the story’s progression. I’m especially interested since it could lead to a much more evolved version where he ultimately becomes fully Gearo. Now, can you give us an insider’s view on the development process starting with the concept stage leading up to final product? BRIAN STEVENSON: The entire process took around 5 months. That’s from initial concepts to final product on the table at Power-Con. In the early days of Spy Monkey Creations we wanted to make figures. They were going to be 3¾” scale and similar to the JLU figures. We scrapped that idea because it was going to be too centered on customization. There really didn’t seem to be that many customizers out that could keep a line like that alive. From there the fantasy based weapons came about after demands from fans saw the early custom weapons we made for ourselves. Those did very well but as a company we just didn’t feel comfortable surviving by only producing swords and shields for He-Man figures. There are companies and groups out there, like ours, which fit into this mold as a third party company making stuff for other toylines. We just didn’t want to rely too heavily on another company and solely continue being third party because we wanted to build our own cohesive toyline. In order for us to really grow and become something that isn’t considered third party we decided to take our next step. Some of the first sketches were very much like little stone and rock like creatures. The Glyos joints were still there but they were much more organic. They were elemental-type looking characters and had the look of being made of materials like wood and stone. We wanted them to have that squat build that’d give them that bulky 80’s He-Man vibe. As we started designing the lines became cleaner and crisper and they went away from being organic to being somewhat robotic/armored characters. Between Jeremy and myself we probably had a dozen pages of concept drawings in each of our sketchpads. We shot over concepts to Matt Doughty of Onell Design to look over them and he sent us back some suggestions. We took some elements from what he suggested and merged them with what we were doing and continued to evolve their design. Palidar’s head, for instance, is a variation of one of Matt’s designs. Palidar kind of came from his idea and I reworked it to better fit the Weaponeer’s aesthetic. We were very set in keeping the squat stance and we wanted them to be really large characters. 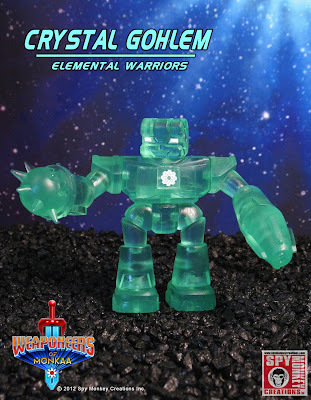 The Glyos characters are around three inches and the Glyos-compatible Outer Space Men that the Four Horsemen are doing are in the 3¾” range. It wasn’t until the new Cyclops character that they had a behemoth. That’s exactly what we wanted to with these; make them big and chunky with some really big build-able parts within their design. There’s lots of potential for big builds with these parts. In their standard state they maintain plenty of poseability. They can sit down and bend at multiple joints. By popping out the arms at the elbow and joining the lower and upper parts of the arms at the forearm peg-hole it gives you the affect that the arm is bent. The same thing applies to the legs to give the affect of a bent knee. The conceptual design phase probably took around three to four weeks before we started committing anything to clay. At that point we hadn’t even developed Empyreus and Umbreus as characters. The original concept was going to be the Minions of Monkaa and they would be little minions that joined your 6-7” action figure lines. As our concepts progressed we decided that we wanted our own main characters that are good guys and bad guys. We kept the initial concept intact by keeping minions which became the Gohlems. We started asked ourselves several question once we settled on having our own main characters. Why do we buy the figures that we do? Why do we, as older guys in our thirties or older, buy little plastic men and put them on our shelves? It’s the nostalgia factor. We all remember the fun we had with toys very vividly and fondly. That’s why toys sell because there’s guys like us that buy them up for that reason. So before we started committing things to clay we looked at other toylines to find the reasons we wanted particular figures and what made them so cool and distinct. All these toylines like Ninja Turtles, Super Powers, Battle Beasts, M.A.S.K., etc, from the ’80s that we collected and loved fondly gave us so many cool elements to work with. With all these elements we decided to mix them up to see what we could come up with. 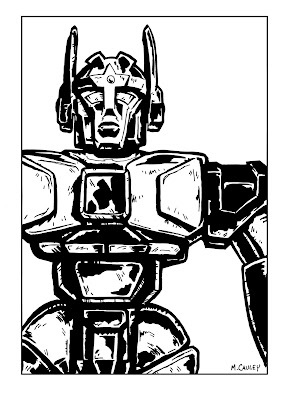 While sculpting Empyreus we’d look at him and say to one another how he favored multiple characters like Rodimus Prime and Crystar. We stylized a lot of these elements to work them into what we envisioned was the Weaponeers aesthetic. During the design and sculpting phase we were evolving these characters into who’d they’d become within our story. Jeremy and I spent three or so weekends sculpting and once initial sculpting was done he took the parts for further revisions and refining. We probably traded a thousand emails and pictures between the three of us during this stage of the sculpt’s development. Once done, we sent them off to the factory for tooling but we had to rework them since the space within the tool wasn’t able to hold the amount of parts. At this point we basically had to go back and redesign them after we had just locked our designs down. With the changes completed we shipped them back and the factory took our sculpted parts and refined them so the planes were level and the parts fit as snug as possible. About five weeks later we had our steel tooling cut and ready to go. Another five or so weeks later we received the test shots, reworked those, shipped them back, received the paint masters and and had a few corrections on those to make. All in all we can definitely relate to what we’ve heard before about toy companies needing a year to put product on shelves because with the Weaponeers, it took us nine months. Add to that the fact that we’re a three-man operation so the turnaround from us to the factory was quicker compared to big toy companies and the corporate hoops they have to jump through. Less than a week before Power-Con we had them in-hand just in time for the reveal. Along with the hard work and sleepless nights we put in a lot of love into this line so to witness the process from our initial ideas and concepts to the final figures in our hands has been great. To be able to hand these figures off to others and see how they enjoy them and create with them, knowing that we made that happen, has been really rewarding for us. V: Based on Spy Monkey’s previous items I wasn’t worried at all about what we were getting with the Weaponeers. They’re definitely bulky and it gives the figure that 80’s “squat” build and heft that you were looking to achieve. There are lots of lines along with angled shapes and edges. Looking back at SMC’s resin weapons, there was more of a fantasy vibe compared to these more armored/robotic figures. Can we expect to see some of that show up in future figures? B: Absolutely. This initial lineup needed to have parts that were as universal as possible. With the way our tooling breaks down, we can use the limbs of this lineup’s figures but sculpt new torso and chest pieces to add variety to our overall parts library. We would love to do some hexagonal pieces that’d look like a big hex nut as a chest or rounded pieces that could double as wheels. This initial lineup doesn’t confine the Weaponeers aesthetic at all; it’s just what we focused on for this first drop. As we create bigger builds with parts from multiple figures in this lineup we’re also coming up with ideas for parts that we can add down the line. So as far as aesthetic goes for this line we can definitely delve into other shapes. There’s plenty of wiggle room going forward. END PART III – PART IV coming soon!